BGKLLEN is one of 31 LLENs (Local Learning and Employment Networks) around Victoria. We run a variety of programs to help young people in the local area. 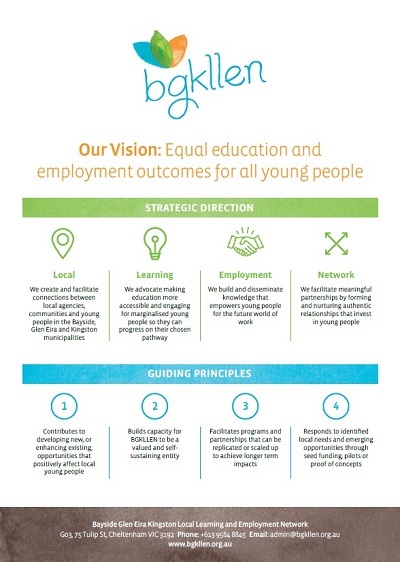 The Bayside Glen Eira Kingston Local Learning & Employment Network (BGKLLEN) is an incorporated organisation that takes on contracts and funding that allows us to support young people in our community through strategic partnership brokering. Our LLEN contract through the Vulnerable Children Branch at the Department of Education and Training allows us to work with schools and community to identify and support disengaging or disengaged young people. Our current focus is on barriers such as anxiety, self-regulation, future job skills and educator professional development. We have current partnerships with Foundation for Young Australians, Anxiety Recovery Centre, Centre for Excellence in Child and Family Welfare and our local councils to achieve our goals. The BGK LLEN has over 100 members in the Bayside, Glen Eira and Kingston LGAs and has strong relationships with 33 secondary education providers and over 100 local businesses.